Hounslow Council has launched the online document to make it easier for young people to access the help they’re entitled to, including a range of support about finance, accommodation, safety, health, education, training and how to get their voices heard. The Local Offer for care leavers aims to clearly set out in one document, what care leavers are entitled to, and what we expect from care leavers. It will help care leavers make the most out of services available to them and provide support with the transition to adulthood and independence. Care leavers can now access support until they are 25 years of age. Care leavers aged 18-20 on a low income and who qualify for Council Tax Support (CTS) will receive up to 100 per cent reduction on their Council Tax bills. The leaving care team will pay Council Tax bills for care leavers on a high income who are not eligible for CTS. Councillor Tom Bruce, Cabinet Member for Education, Children and Youth Services, Hounslow Council, said: “We want our young people to have everything that good parents want for their children: to be happy, safe, protected and supported. 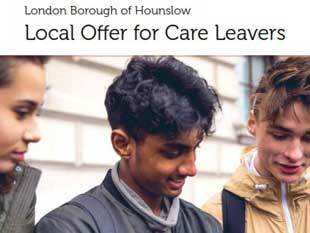 The Local Offer for care leavers was written and designed in partnership with a group of Hounslow care leavers.